WE THOUGHT IT WOULD BE EASY. 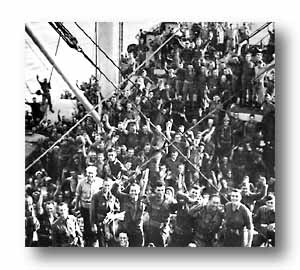 General Eisenhower's dramatic announcement of Italy's unconconditional surrender came over the ship's radio at 1830 on the eve of the invasion and started speculation as to whether there would be any fighting at all on the following day. Commanders assured the troops that there would be, but smiles and moderate celebrations could not be restrained. The first wave fanned out onto all four beaches exactly at H-Hour, 0330. Enemy guns roared as 36th Division infantrymen leaped into the water and started inland for the pre-designated assembly areas. 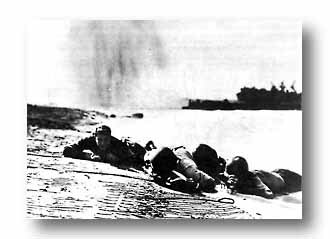 On the left at Red and Green beaches the 142nd Infantry, commanded by Colonel John D. Forsythe, began the push that was designed to take it to the core of the beachhead and to the ground around Albanella and Altavilla. On the right at Yellow and Blue beaches, the 141st Infantry under Colonel Richard J. Werner, moved to maintain contact with 142nd at Mount Vesole and Magliano, seize Agropoli and defend the right flank. The second and third waves hit the beaches at eight-minute intervals. Both assault battalions of the 142nd on Red and Green beaches were pinned down from time to time. On the right flank the assault battalions of the 141st Infantry landed on schedule and began working through wire obstacles and mines. Intense fire from machine guns, field pieces, mortars, and tanks made their progress difficult. Everywhere there was great confusion. Officers and men were separated; assembly points were not easily located. Shortly after 0530, the amphibious "ducks" came ashore. The 133rd Field Artillery Battalion brought in twelve 105-mm howitzers. Each of these guns was loaded on a "duck," together with 21 rounds of ammunition and a gun section of seven men. NAVAL BEACH PARTY ASSUMES THE HORIZONTAL WHEN ENEMY PLANE SKIPS IN. NOTE BOMB SPRAY. At 0640 the 143rd Infantry, initially in reserve and commanded by Colonel William H. Martin, crossed the beaches and began moving toward Cappacio, a village on the slopes of Mt. Soprano. MUTILATED GERMAN MARK IV TANK which had counter attacked on the beaches in an attempt to drive the 36th back into the sea. Almost from the moment of landing, enemy tanks in scattered positions had made it difficult for all combat teams to reach their objectives, but not until 0700 did they attack on a large scale. At this time the battalions of the 141st were still attempting to reorganize when they were struck by 15 or more Mark IV's, five on each flank and at least four in the center. Then a column of the 36th Cavalry Reconnaissance Troop landed on Yellow Beach and helped to fight off seven Mark IV's which were firing opposite the right flank. In the center of the 141st line, the men of the 2nd Battalion beat off tanks with infantry weapons. Meanwhile, more tanks threatened the 1st Battalion in the fields south of Blue Beach. For its role in repulsing the enemy tank attacks, Lt. Col. Edward D. McCall's 3rd Battalion of the 141st was awarded the Division's first Presidential Unit Citation. By noon the main tank assualt on the southern beaches had been brought virtually to a stanstill. Naval gunfire and fire from mortars and howitzers had helped to make the operations costly for the enemy, but to a large extent the battle had been fought by infantrymen and infantry weapons. To the north the principal tank attacks came later. At 1145 Division CP personnel in the tobacco warehouse at Casa Vannulo saw 13 German tanks approaching. From the ditches along the railroad the men watched the enemy come within easy range. On the main coastal highway an artillery piece, set hastily in defense, opened fire. Another howitzer was brought up and unlimbered from its "duck" carrier even as the tanks were nearing, and fought off the German armor. When five of the enemy tanks were KO'd, some at 200 yard range, the rest of the Germans turned. Throughout D-Day, while the 142nd on the left flank fought toward Hill 140, and the 141st on the right struggled forward, the 143rd RCT was forced to occupy a wide front in the center as it avanced. On the left flank of the Division, Lt. Col. Samuel S. Graham had assembled elements of the 2nd Battalion, 142nd near Paestum station at 0645 and with them moved east to the Capodifiume River, a half hour later. AN INFANTRY OFFICER takes cover in an abandoned enemy emplacement as German mortar fire sweeps the beaches during an early stage of the invasion. Prepared positions and mines were numerous on Salerno beaches. By 1000, Colonel Martin assembled the 143rd's two leading battalions, the 2nd and 3rd, at the railroad. Their objective was Hill 386, a projection running northwest from Mount Soprano and ending abruptly in a cliff just above the junction of the roads to Capaccio and Rocca d"Aspide. Mount Soprano, dominating the entire area, was an important objective of the Division. By nightfall on D-Day the 143rd controlled the southeast slope of Mount Soprano and a vital stretch of the road leading to the plain. In anticipation of the fierce struggle, Lt. Col. John N. Green, commanding the 132nd Field Artillery Battalion (Pete Green's Mortars) coined a Division classic on the eve of D-Day. Asked by one of his men, "What are we going to do if we run out of ammunition?" "Fight with the Rammerstaff!" was the Colonel's bellowing reply. ON THE SECOND DAY of the battle, units of the 45th Division pass an enemy tank which was knocked out near the 36th Division CP in the tobacco warehouse. Four other German tanks lay shattered in fields nearby. The 36th Division, untried in battle, had landed under fire, overcome prepared beach defenses, and reached its initial objective. The Allies now controlled the plain south of the Sele River and occupied the high ground, an average distance of five miles from the beaches. On the right flank, the 141st Infantry had absorbed vicious enemy attacks, but was ready to occupy its assigned objectives on September 10. Men, vehicles, artillery, and supplies continued to pour onto the beaches, where the engineers labored efficiently under constant fire. The hours of confusion had passed. Dumps were set up, exit roads were operating, anti-aircraft batteries were in position, and communications finally working. The Salerno landing had been sucessful in spite of a prepared and alerted enemy. The 36th now occupied the important hills from Altavilla to Ogliastro. On the 10th of September, the second day ashore, the beachhead was enlarged, positions consolidated, and more tanks brought in to prepare for heavier clashes to come. The 142nd Infantry moved forward in preparation for an attack on Altavilla and Hill 424.